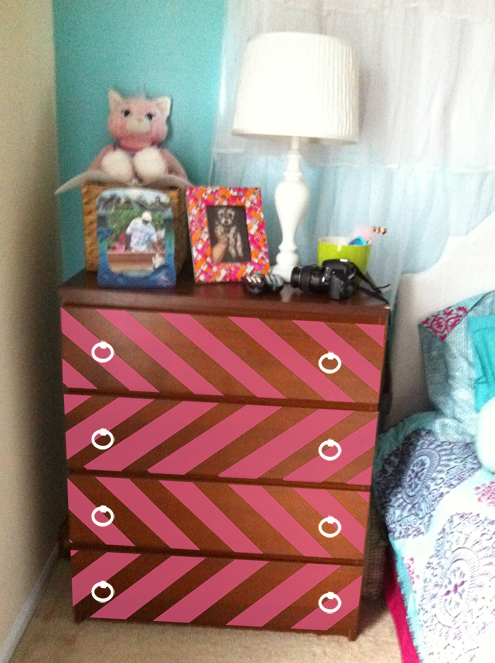 IKEA Malm Dresser Makeover, Finally! 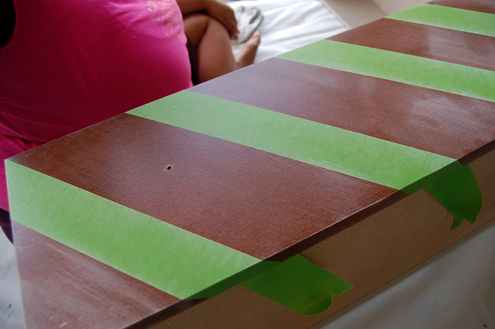 How long ago was it that I first talked about refinishing my daughter’s IKEA Malm dresser? It was sometime early this year, I think. Well, I’ve finally gotten around to it, and I LOVE the result! Pinterest has been the catalyst of a lot of projects around here lately. I can spend hours getting lost in inspiration there, but I’ve been trying to take more of that inspiration and turn it into real projects. So I jumped right in and started taping off the lines. I was so gung ho that I decided not to measure. I just eyeballed the distance between each stripe. Because the drawers mark the meeting point of each sideways chevron, I was able to get away with this approach. I created my tape lines with the drawers still in the dresser so I could look at everything vertically and see how the finished result would look as I went along. All I had to do was match the tape lines on the drawer below with the one above it. The final look isn’t perfectly spaced, but I’m OK with the slightly asymmetrical lines. I have been obsessed with ring drawer pulls for a long time, and I was determined to use them on this piece. I couldn’t find any that I liked locally, so I wound up ordering these Hickory Hardware pulls from Amazon. They are nice and solid, but not too big or too small. The 3″ diameter made them the perfect size for these drawers, which measure 8″ vertically. I measured 3.5″ in from the edges of each drawer and 5.5″ from the top and marked where I wanted the pulls to go. My hubby was kind enough to drill the hardware holes for me. The key is making sure the drill bit is just a tiny bit larger than your screw — but smaller than the screw head — so it can slip through to catch the grooves on your pull. You may have noticed that the pulls are white in my Photoshop mockup. Well, I planned to spray paint them white. But once I put them on the dresser, I liked the look of the satin nickel finish enough to leave them as is. I was wary about how a piece of IKEA’s inexpensive MDF furniture would handle being sanded and painted. I know that their solid wood pieces are hacked and painted all the time, but the Malm line has a laminate finish. After a ton of Googling and reading, I figured it would hold up relatively well and I got to task. I used medium grit sandpaper between my tape lines. I wasn’t trying to go past the laminate. I just wanted to remove the slick finish and rough up the surface so the paint would have something to grab. You probably can’t tell much of a difference in the photo above, but trust me when I say you could see a visible change in the areas that had been sanded and the areas that had not. I debated using primer, but decided to go without it. I regretted it later.We did four very thin coats on each drawer front, and we also did the edges. 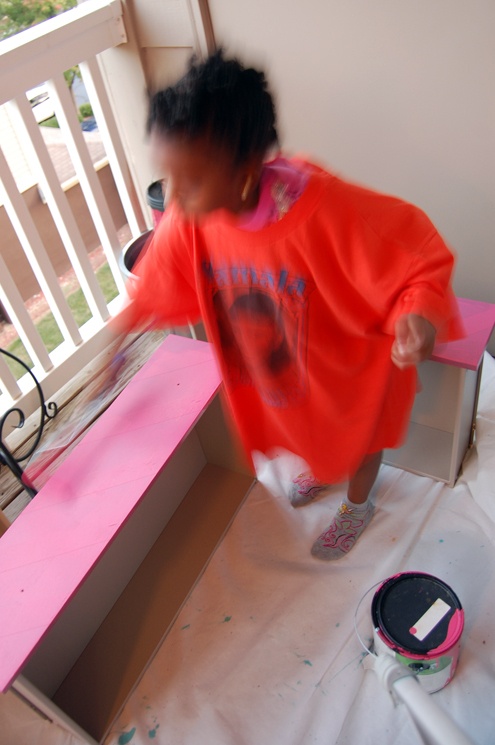 Since we were painting on the patio, my daughter got in on the painting action — wearing one of my old t-shirts, of course. She’s been itching to paint for a long time, so I figured this was a good opportunity for her to learn proper “technique.” Lol. I talk like I know what I’m doing! I let the paint dry for about an hour between coats and planned to pull the tape while the last coat was still a little tacky. Unfortunately, it was night time, and I fell asleep. When I woke up the next morning, I knew right away that I was going to be in trouble. The problem with painting over laminate is that no matter how much you sand, the surface will still be a little slick. And latex — which all low-VOC paint is made of, to my knowledge — is notoriously easily to peel away in layers. So I started peeling the first piece of tape gingerly. Within an inch, the rest of the paint started coming off with it. I tried using an Xacto knife carefully at the edges of the tape. Not a good look. The blade started peeling the tape, too. By the time I was done pulling tape, I had exactly 3 clean tape lines. The rest of them had peeled in horrible, jagged shapes. NOT the clean lines this chevron pattern required. This was about the time that I started wishing I had used primer. I don’t know for sure that it would have helped, but at least the paint would’ve had something else to adhere to. I was pissed with the outcome. So pissed that I forgot to take photos. Still, I knew it was my own fault. I knew I’d have to start over, so I just went ahead and peeled/scraped the rest of the paint off. That took about an hour of grumbling and cursing, but eventually, I got most of it off. There was a silver lining, though. Because I’d sanded over the tape, I could clearly see the pattern I had originally taped. The sanded areas were very visible, so I just laid down new tape lines over the old, un-sanded areas. When I was done, I resolved not to make the same mistake twice. I again painted in 4 thin coats (again, sans primer — I really didn’t learn the first time, huh?). However, I only let the drawers dry for about 15 minutes between coats. 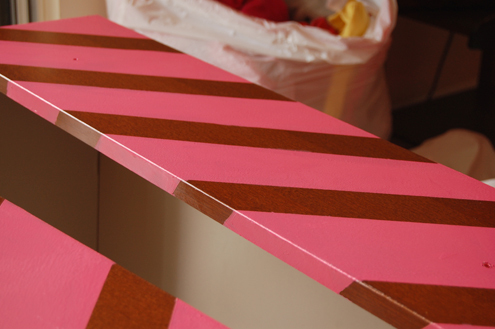 And AS SOON as I was done painting the last coat on the last drawer, I pulled the tape. Sweet success! The lines were clean, but for a tiny amount of bleeding from the edges of the tape. I let the drawers dry for a full 2 hours before coating everything with some low-odor polyurethane. Honestly, I need to find another brand, because that stuff still smelled and gave me a headache. But I did the recommended 3 coats, with a light sanding between coats with fine sandpaper. Because of the smell, I let the drawers dry for a little more than 2 days before I put my daughter’s clothes back in them. I love the juxtaposition of the sharp chevron lines next to the looser, more bohemian pattern of the comforter. So what do you think? Have you ever had a project go completely sideways like this one did? Did you give up, or start again? Because I definitely considered giving up this time! It looks GREAT! Believe me I’ve had similar problems when painting. I think you posted a photo of one of the dressers I repainted. It took me literally an entire summer to get it done. I re-did it so many times I was sick of the whole thing when I finally finished, but after a few days fell in love with it all over again. The best part was that it cost less than $10 and if I ever get sick of it I won’t feel sad about letting it go. Anyway, congrats on a great job. This looks fantastic! I absolutely love it.Hmm. What can I do this to?? I need to search the house. I would have died and gone to heaven if I would have had this dresser as a kid! You’re a great mom! Unfortunately my ADD doesn’t allow me to start and finish many projects, especially with snags like you had! I can admire, though! What a great way to jazz up a plain dresser. I will have to give this a try. Really cool design! I really love it.. I am so excited to try this with my drawer! Sounds like quite the adventure to get it done. But I must say well worth it in the end! Great job! Good job Jennae, you paint like a pro. It seems you having a great time this summer. Continue your good work. 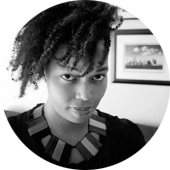 I just stumbled on your site and this post feels like it’s been written just for me! I desperately want to revamp my children’s playroom but I don’t want to spend too much money as in about 6 months it will be revamped into my daughter’s bedroom. 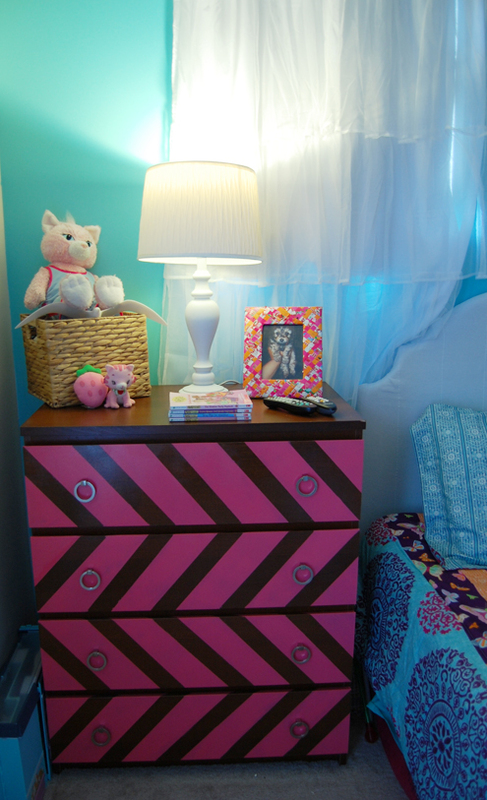 I adore what you’ve done with the dresser; it looks amazing and so damn cool! I have a similar Ikea chest in our playroom, its painted cream… I am ashamed to now say, but I am going to hot foot it to the paint store tomorrow and get a bit creative with the old tins o’ paint. Looking forward to nosing around your blog a little more! There is a paint especially for laminate. We painted over our kitchen cabinets. It worked great! There’s not too many color choices. Ask for it at Lowe’s. Thanks for the tip Pam! 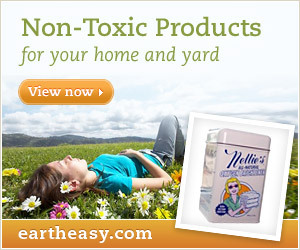 Would you happen to know if it’s low- or no-VOC? Love it! Thanks so much for detailing your process, what went wrong, & what made it right. I have yet to do furniture, but I got creative with a wall in our pass-through dining room one night while hubby was at work (pre-kids) after watching HGTV. I taped off 12″ x 12″ squares in a checker board pattern with a width of the tape (about 1″) between rows/columns. The wall is white & I painted every other square blue. I wanted each end & top/bottom of the wall to have a full square, so I started taping from each end & met in the middle. This resulted in a sliver between the middle squares (which DH inquired about, lol), but I think it’s interesting & adds a mirror effect. For the verticle I made up the difference by making the 2nd row from the top eat the difference, so that row is just a bit shorter in height, but, again, I think it adds interest. This looks AWESOME! I got the entire Malm bedroom set for a wedding gift from my father. It’s been five years and it’s holding up great. I’m painting everything to give the room a new look. The bed and nightstands are in a sunroom bump out so I’d like to paint them with a light flowing stencil design that I will print out on vinyl from the Cricut. 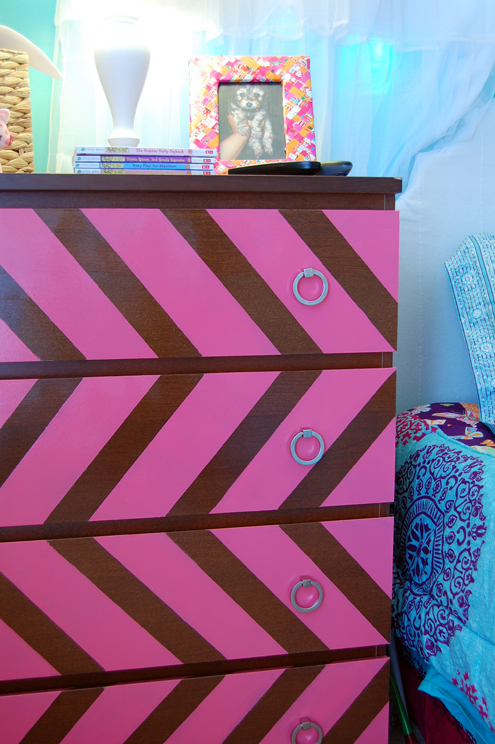 The dressers are in the main part of the master and I want to duplicate the pink chevron on my wife’s and an electric green on mine. The pink turned out great. I have the same color set. Thanks for the doable inspiration! You are very welcome! I hope you are able to learn from my mistakes 😉 And projects like what you describe are exactly why I want a Cricut. I have so many stencil ideas, but no patience to cut them out by hand. I’d love to see pics when you’re done! Very cute drawers.. I really love the patterns design.. 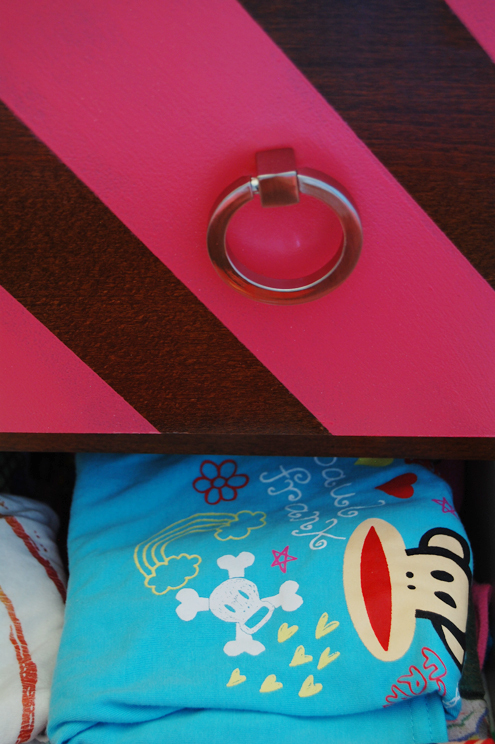 This is a great idea for our old drawer! Thanks for sharing this tips! Looks Fabulous. So modern and cheerful. So cute! love chevron soooo much right now! great job. love that bedding too. anthro? Ooooooooooo girl I am inspired but truly scared. So the secret is pulling the tape off while wet? Next post: Feeding the Birds, Halloween style!